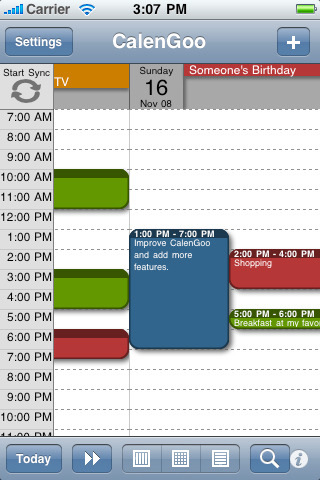 The calendar view is similar to the web view of Google Calendar. Events are displayed in the same colors that you use in your Google Calendar. It also recognizes which calendars are visible and which are hidden. So the view should match the view of your Google Calendar as much as possible. It also works with your recurring events and even when you are offline or scroll far into the future, they are correctly displayed. You can also use Google Calendar’s feature to invite people to events and see their status (accepted, declined, maybe, no answer). They will get an invitation email with links to e.g. accept or decline the invitation. You need a (free) Google Calendar account to use this program! If you have problems to log in with CalenGoo, please make sure that at least one event is in your calendar. If you think the font is too small and hard to read, you can increase the font size of all calendar views in the settings under “Settings”, “Colors etc.”. If you have problems with the speed, please contact me, then I can examine the problem and try to improve it. CalenGoo is always tested with a Google Calendar account with four years of events (several thousand events) on an old iPod Touch and an iPhone 3G. Especially on new iPods and the iPhone 3GS speed should not be an issue, but also on older devices it should be usable and not be too slow. Please contact me under calengoo@dgunia.de.